Class is limited to a very intimate size of 10 people. Students sign up for a month at a time and are given priority for the following month. Thus a continuity and sangha-like atmosphere has developed. We meditate for the last 15 minutes of class. Attendance on a drop-in basis available only by making arrangements with me. Contact Patricia at psullivanyoga@gmail.com for details. Join me on Yoga Anytime, an online subscription service offering a wide range of Yoga teachings, including asana, pranayama, meditation, chanting, philosophical talks and Sanskrit lessons at all levels of learning. This on-line format offers exposure to a variety of teachers and every one has something valuable to share. The availability and quality of the philosophical discussions makes Yoga Anytime an invaluable resource in understanding, enjoying and integrating the teachings into your life. Yoga Anytime offers a variety of shows centered around a theme. 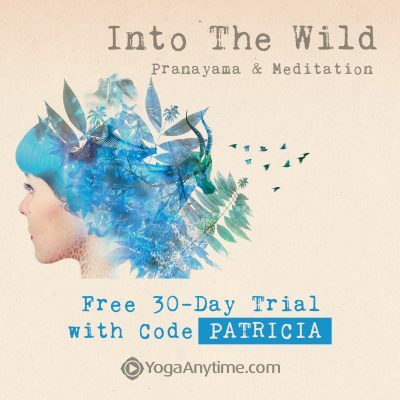 Into the Wild focuses on pranayama and meditation. In Season 3 you can practice along with me as I guide you through a series of breathing practices and meditations, preceded by appropriate asana preparations. This series is designed to help you experience the deeper aspects of yourself, where you discover an innate center of calm within. 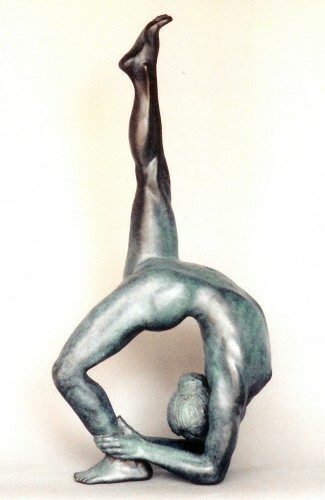 “Shoulderstand with Chair” a 30 minute practice. If you’re not strong or open enough to safely hold Shoulderstand for more than a minute or two, you shouldn’t! In this Yoga Anytime video I offer a supported version that my students with various forms of neck mischief have learned to get themselves into and easily hold for 5 or even up to 10 minutes. It provides spinal traction as well as a deep and spacious chest opening, thoroughly calming your thought-mind and opening you to a loving and profound experience of universal heart/mind. Prior to the chair pose you’ll so some rolling in and out of Setu Bandanasana – bridge pose – with hands overhead pressing on the wall, beginning the process of tractioning the spine. Then you’ll transition to resting your sacral bone on a foam block with a great psoas stretch, further preparing you to ease into the full opening you see in the photo. Included are plenty of details and suggestions about how to use the chair safely and how to get into and out of the pose. I’d love to hear from you through Yoga Anytime or via my web site about how it goes for you and am happy to answer any questions. Enjoy! “Maha Mudra” The Great Seal, which seals a specific energy deep within the subtle body. 50 minutes. “Maha” in sanskrit refers to greatness. “Mudra” has exoteric as well as esoteric meanings. We can create specific shapes with our hands and/or whole body to invoke, invite and even seal energy in the subtle body. “Mudra” also refers to an old fashioned method of sealing a letter or message using hot wax and a hand stamper with a specific image imprinted on it which lets the receiver of the letter or document know it comes from a trusted source. So we could think of this as a way of sealing a message within the envelope of our body deep into the subtle body. That message could be a mantra, “Ahem Prema” ~ I am Divine Love; “So Ham” ~ I am That, meaning the infinite. “Pelvis, Hips and Core” a 35 minute session. Although the title of this lesson on Yoga Anytime addresses the anatomy, it’s actually about finding access to our own deep Primal Trust. In this practice we’re learning to awaken the Jatara Agni, or Digestive Fire which refers not only to digesting food but having the capacity to assimilate and integrate any experience into our being. Thus we begin to develop and tap into a deep level of Primal Trust, both in the world and in ourselves, knowing that we can be truly present with whatever arises. This refers not only to difficulties, but also opening to receiving acceptance and love, from without and from within. “Hamstring Stretch at Wall” a 10 minute floor session which uses belts to obtain a very effective traction release for the hips and low back along with the hamstring stretch. “Pranayama for Meditation” a 15 minute seated session that introduces a grounding hissing sound as well as brahmari, a bee-like sound which calms the mind and soothes the nervous system while connecting our root to our crown. A great prelude to meditation. Take advantage of my therapeutic skills acquired through many years of study and practice. I can also help you design your own home practice, including pranayama and meditation, and personally guide you in clarifying your understanding of your own personal needs. I welcome you to reach out to me at psullivanyoga@gmail.com with respect to yoga and/or Egoscue®. I am certified by Egoscue® University to offer their approach to postural therapy. I began studying this method several years ago after their approach resolved many painful issues that I had been struggling with for years. When you are with me for an Egoscue® session I assess the alignment of your body, and design a personalized routine to correct your specific imbalances, which are often the cause of chronic pain due to muscular compensation and uneven pressure in and wearing of the joints. Then you can return to all your activities, including yoga practice, and enjoy greater benefit in a body of ease and balance.